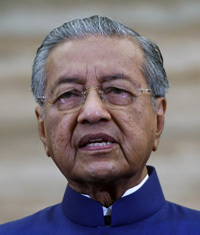 KUALA LUMPUR: PAS had decided not to support UMNO in the Semenyih state assembly by-election, said Prime Minister Dr Mahathir Mohamad today. The Parti Pribumi Bersatu Malaysia chairman said the matter was voiced by PAS president Datuk Seri Abdul Hadi Awang who met him at the Al-Bukhary Foundation, here yesterday. “In the meeting, we talked a lot about politics. A lot of political talk, among them about PAS in the Semenyih by-election, this time it (PAS) will not be supporting UMNO. “Hadi informed me that PAS will not support UMNO. There is also a written and signed acknowledgement,” he said after delivering his keynote address at the Democracy Festival Kuala Lumpur 2019 organised by the Forces of Renewal for Southeast Asia (FORSEA), here today. Abdul Hadi was quoted as saying yesterday that his meeting with Dr Mahathir on Friday was to discuss administrative coordination between the State and Federal governments.